Two deep pits are to close next year with the loss of 1,300 jobs after the government announced it was loaning UK Coal £10m for "managed closure". UK Coal plans to close the pits at Kellingley, North Yorkshire, and Thoresby, Nottinghamshire. Business Minister Michael Fallon said the taxpayer would face "significant losses and liabilities" in the event of UK Coal's immediate insolvency. The National Union of Mineworkers (NUM) said it was "a kick in the teeth". In a written statement to Parliament, Mr Fallon said: "There is no value-for-money case for a level of investment that would keep the deep mines open beyond this managed wind-down period to autumn 2015." Immediate insolvency, he said, would mean significant losses and liabilities relating to "redundancy and unpaid tax liabilities". "Considering this, the taxpayer is better served by supporting a managed closure of the mines," said Mr Fallon. The proposal, which ministers have been considering since 21 March, would see the two deep pits face a phased shutdown and UK Coal's six surface mines being sold off. Mr Fallon said the government's agreement to participate was subject to final terms "that provide adequate protection to taxpayers" as well as assurance of backing from all parties, including the trade unions. Labour MP Dennis Skinner said the government had "just stolen £700m out of the miners' pension fund... Come on, help them out"
He said a "rapid response service" would be available to help employees try to find new work and retrain. Mr Fallon said the directors of UK Coal had approached the government at the end of January to report that a falling coal price, exchange rates and other factors meant that "the viability of the business was potentially in doubt". It is understood that private sector investment will come from rival mining group Hargreaves Services and Harworth Estates, landlord of the two mines. Mr Fallon said in a separate statement: "We are doing everything we can to help in this unique situation." Chris Kitchen, the general secretary of the NUM, said: "The union is disappointed with Michael Fallon's response while still insisting on strings attached. "No assistance has been given to coal, but the country will be reliant on coal for at least the next 10 years. "We feel we have been treated like the poor relation when compared to other industries that have received government support. It's a kick in the teeth." Kevin McCullough, chief executive of UK Coal, said in statement: "This proposal offers the best opportunities for our workforce, our customers and our suppliers. "Without the support to close the business on a phased basis to 2015, we would have been announcing an immediate insolvency and 2,000 job losses." 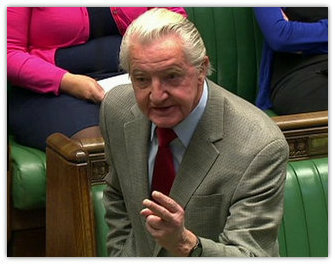 Speaking during business questions in the House of Commons, Labour MP Dennis Skinner, who represents Bolsover in Derbyshire, told Business Minister Matthew Hancock: "Are you aware that one of the smallest businesses in Britain now is the mining industry? "There are three pits left - 1,300 miners are due to be sacked at two of those pits. That will make it a minuscule, small business." When told there was "a package of support" for the miners, Mr Skinner told the minister he had read it. "It's a load of crap," he said. Trades Union Congress (TUC) general secretary Frances O'Grady said the government's "refusal to fund a long-term rescue plan" would cost 2,000 jobs and leave UK businesses and householders "at the mercy of overseas energy suppliers". One option open to the government, said the TUC, was applying "to Europe to use £60m of taxpayers' money in state aid" which would have kept the pits open until 2018. "Faced with the choice between closing two of the UK's three remaining coal mines next year or of fighting for their future, the government has gone for the short-term option and taken the easy way out," said Ms O'Grady.